Remember how easy it was when you bought your very first home? How excited you were? If you are like most people, it probably never occurred to you back then how much more you would have on your plate when the time came to sell that house and move on to your next home. There is no doubt about it; playing the role of both buyer and seller is more complicated than when you’re just one or the other. However, it is far from impossible. Follow these simple tips to simplify the insanity and keep your cool while you make this proud transition. Before you dive into the deep end, make sure you have all of the facts. Consult with your trusty real estate broker and have them review the current market conditions with you, so you don’t wind up losing money on both ends of the deal. Is your schedule more hectic than ever? Throwing yourself into a double-sided transaction may push you over the edge. Remember, there is a lot of work in getting a house ready for market, and even more involved in finding the perfect house. Not to mention, the effort it takes to actually move. If you don’t have the time to do everything yourself, you need to make sure that you will be able to afford to pay people that can do it all for you. 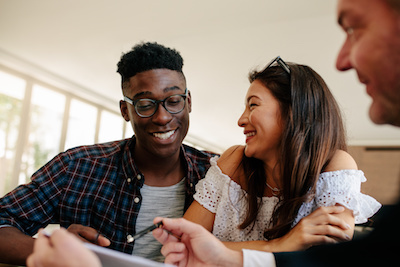 If you plan to sell first, the process will be much simpler and straightforward because you will have the funds you need for a smooth close on your new home. If you plan on buying first, be sure you do so with the help of an experienced real estate broker to reduce your financial risks and limitations. You also have the option of a rent-back agreement which will allow you to rent your current house from the new owners after you close if you need a little time to move. Want To Make Buying And Selling Real Estate As Painless As Possible? Just imagine how happy you will be in your new home when all of the stress of moving is behind you and years of fond future memories in your new home are at your feet. Think of how proud will you feel once you have made the transition! Not to mention, how much more confident you will be if you ever simultaneously buy and sell again. This process doesn’t have to leave you wanting to pull your hair out by the root! All you need is a real estate broker with the necessary experience, skills, and resources to return the joy of buying and selling real estate.